~ Rallying, rallying and more rallying! Event four 07.07.13 JRT Enville Stages at Anglesey. Flashing blue lights and Superman pants, it’s all part of rallying! 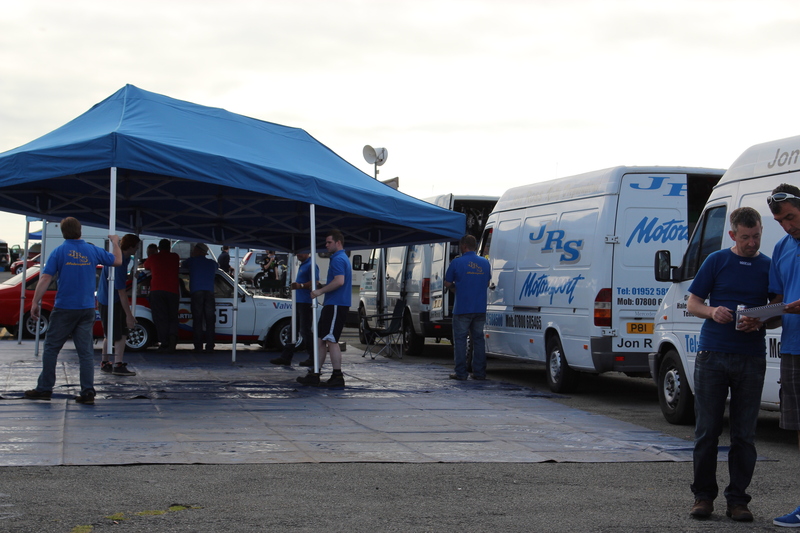 Event four had arrived, the JRT Enville Stages at Anglesey’s racing circuit and it had brought with it gorgeous clear blue skies with not a cloud to be seen. The weather was perfect for a road trip. Could this be a good omen for A & E Racing? Why are we waiting, why are we waiting, oh why, why, why? You could smell the tarmac on the road melting as a heat haze shimmied all around us, distorting and blurring the horizon. We waited, patiently, in the lane for our final competitor to arrive and join the convoy (Errrm weren’t we waiting for you last time as well??!!) and it did look a bit like a school outing, minus the packed lunches and doting, waving parents, with all the blue JRS T-Shirts on show for the passing motorists. Mine was packed my bag ready for tomorrow’s race day. 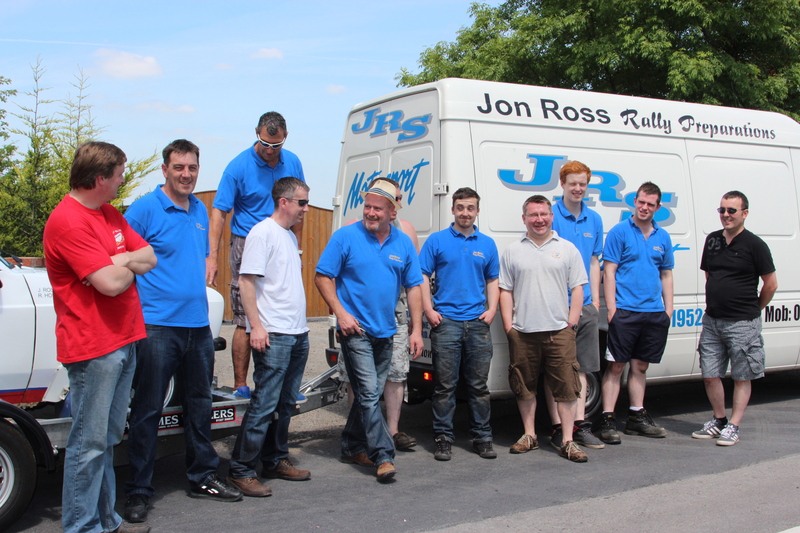 There were four JRS Motorsport cars entered in for the event this time so an extra van had to be commandeered. It had to be a plain white van to fit in. Hmmmm a plain white van? Now who did we know with a plain white van? *Drums fingers on the table whilst deep in thought* Ta Dah, a new vehicle was initiated into the gang, by performing undiscloseable rituals and being “tagged” with JRS Stickers all curtsey of Richard Mason, the window fitter come navigator on this event. Or should that be Richard Mason AKA “Go, Go, Go, Chicane, Chicane, Chicane”. Aren’t in car videos a wonderful invention “It’s a quiet car really Mr North”? 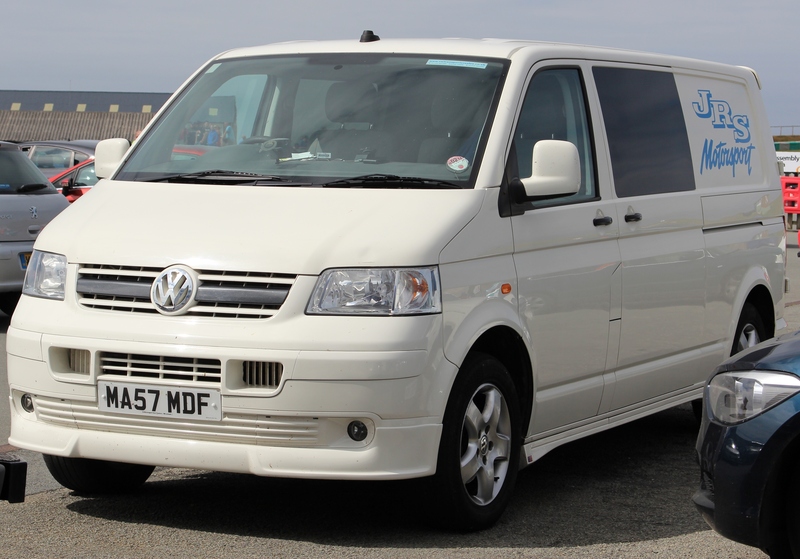 There comes a time in every van’s life where a van has got to do what a van has got to do. Now I have learnt through past experience that the journey to, and sometimes from, the event kind of forms part of the rally itself. Much discussion and planning had taken place about the route that would be taken this time around as the journey back home last time had been won by someone not taking the usual route. We set off on our adventure and I suppose I should have titled this blog post as “12 lads and one girl – part two”! The convoy of four vans and trailers wound it’s way down the twisting country lanes until meeting the main road. 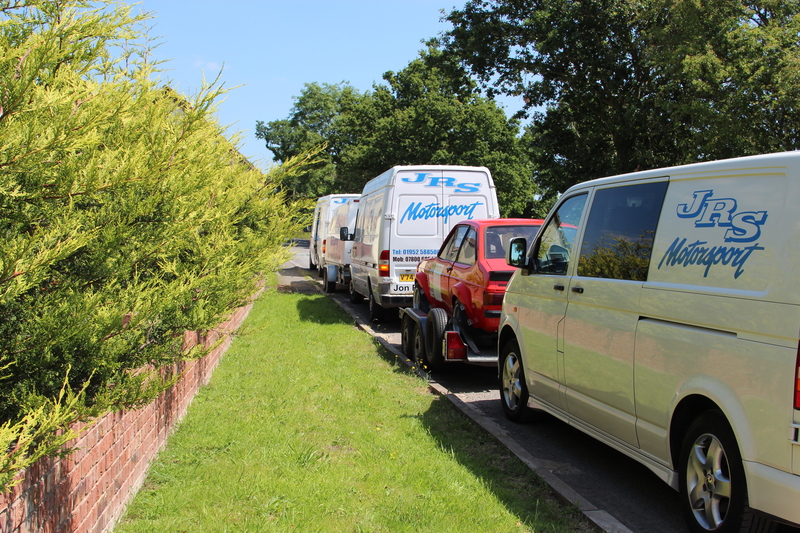 It looked very impressive and caught the eye of several passers by and motorists many of whom did a double take when all four vans and trailers over took them at the same time – sorry, can’t break the convoy! At times the A55 duel carriage way could have been said to resemble scenes from Top Gear. You know the ones, the classy shots they do of all the fancy cars driving alongside each other? Well the lads did their own version albeit restricted by only having two lanes and not having camera men hanging out the back of a Land Rover in front of us! The sea was glinting and shining to the right of us, doing it’s best to beckon us in and majestic medieval castles rose from the hills to the left of us. And then………….flashing blue lights appeared behind us. FLASHING BLUE LIGHTS. Lots of little faces appeared in wing mirrors along the line of traffic as the game began of guessing who he was after. The newest gang member “Go, Go, Go” was subtly persuaded off the duel carriage way and was escorted away for a quiet chat. It transpired that it was advisable not to display trade plates in a car being towed on a trailer. The “newbie” white van met us at track just in time for scrutineering although he seemed somewhat bashful over the whole experience. Will it, won’t it, will it, won’t it? We’re staying out of the way and not getting involved. There was a bit of lane changing when lining up for the scrutineer to check the cars especially when a certain scritineer came into view! It was a lengthy line and it took a while to get all the cars through but we got there and then it was on to the competitors signing on. Cue event number two when a certain driver had not noticed he had been sent the wrong type of licence! This was turning into a very eventful trip and the rallying hadn’t even started yet but it all had a happy, if not slightly expensive, ending. Nobody does queuing better than the British! The day started out warm and hazy. People started out warm and hazy. 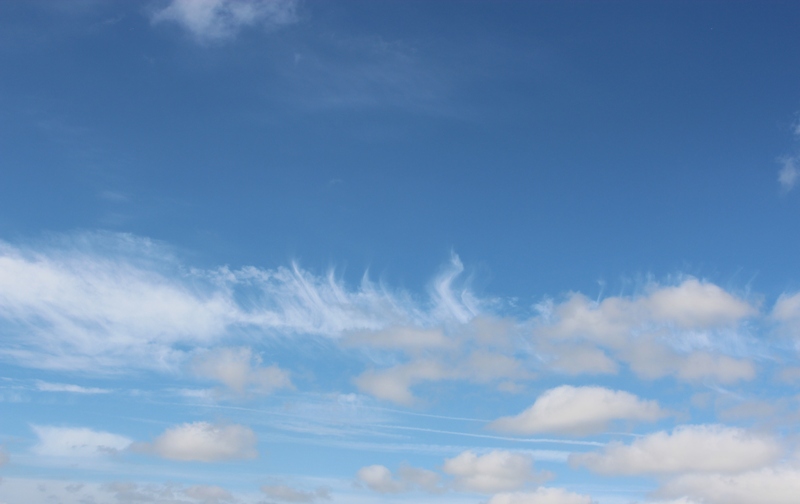 It was the kind of haze weather wise that you knew would burn off and reveal a gloriously sunny day and the type of haze people wise that would slowly fade with the aid of a paracetamol or two. It looked like a mini festival had broken out when we arrived as there was a sea of brightly coloured tents spread out before us. The real sea was beckoning again, it’s pull hard to resist on such a hot day, and the Snowdonian mountains were just breaking through the heat mist. What a place for a race track. What a day for a race. Now I am sure all will agree that it would be fair to say the setting up of the service area was not carried out in the usual snappy, punchy manner it normally is. 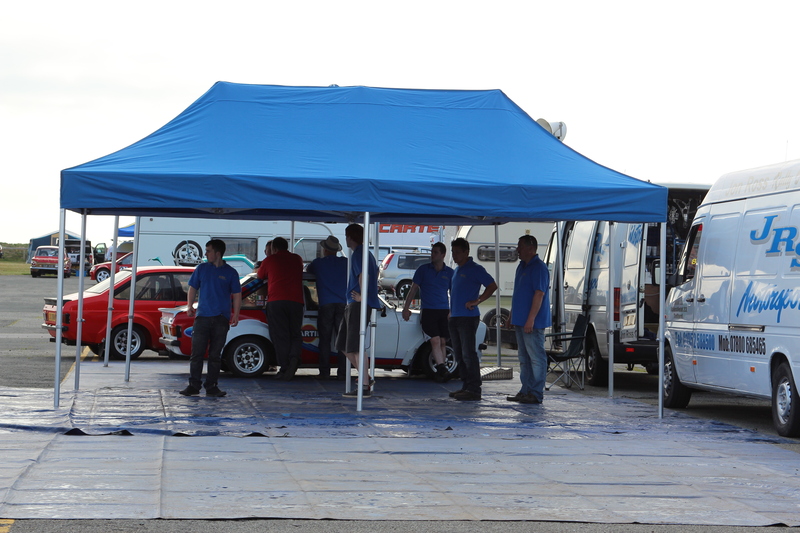 It was a bit more “head in hands….will someone please put up tent four”. Hindsight again. The sun broke through and the haze cleared and it got hot. It got very hot and with no breeze to be felt it got hotter and hotter. More and more spectators arrived, parking their cars on the hill and staking territorial claim to their bit of grass for the day with neatly laid out picnic blankets and cool boxes. The nerves started to build and the adrenaline started to pump. The “fag, toilet, fag, toilet” routine kicked in and before you knew it, stage one was about to start. It was the first time out for Tony with Eddie as his navigator. Even though Eddie came with a wealth of experience I think both of them found the first stage a little daunting before it started. Anxieties were soon laid to rest before the start of stage two and the “grins from ear to ear” broke out all round. Good job really that it is a quiet car as the intercom stopped working at one point but hey as it was a quiet car they could cope with out it. OK, I’ll shut up about it now! 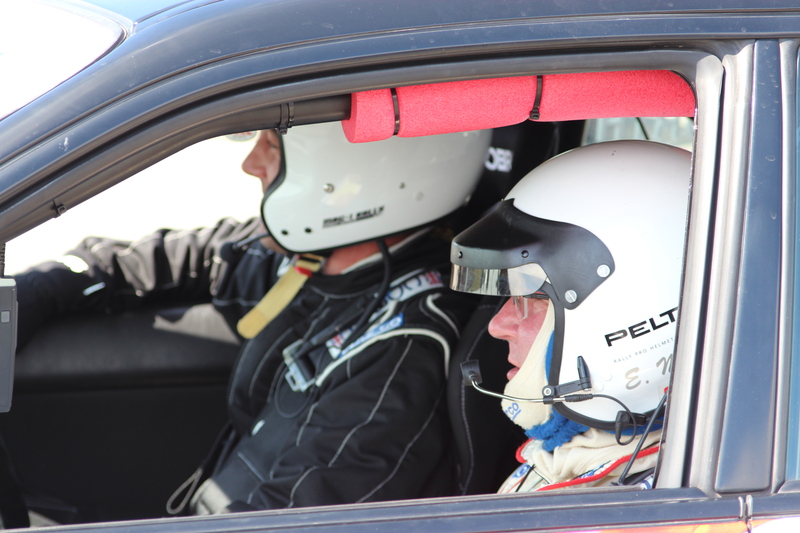 The new partnership of driver and navigator began to work like a dream team. 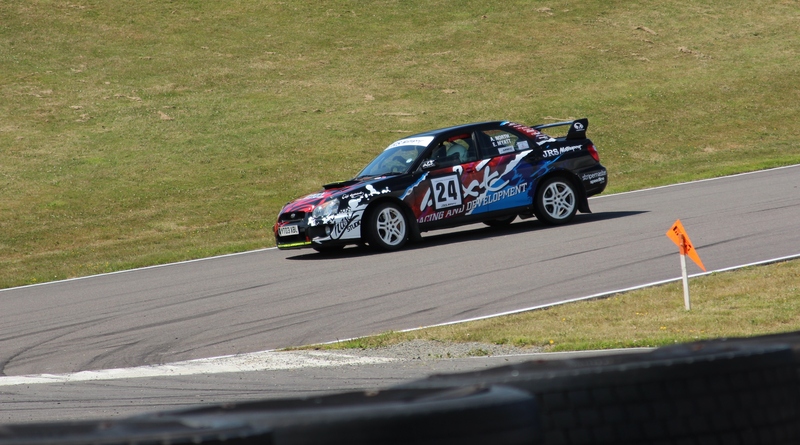 4.44 for stage one, 4.40 for stage two……there’s a theme here, bear with……the times are getting quicker….. 4.06 for stages three, 4.03 stage four, until stage eight. Let’s just say that from now one Eddie will now be known as “Eddie, the split, Myatt”. Did it matter, no not really. All were having a great day’s racing and that’s all that mattered in the end. Yeah, all four cars finished unscathed and in one piece and now that the tablets had kicked in and the haze had lifted, the packing up was the well known “blink and you will miss it moment”. Tent down, tent down, mat rolled, mat rolled, clothes changed in the van, cars on trailers and we were off. The race…..journey…to get home and back to the pub (a very nice country pub called The Plough at Allscott that comes highly recommended if ever you are out our way, with delightful hosts and a fantastic chef who serves food to die for) began. It was all going so well until Colwyn Bay. We were stuck in a two lane traffic jam from Colwyn Bay all the way to Chester. Do these people not know we have food on order back at the pub??? You never really notice how strange some people can be until you are stuck in a traffic jam and start people watching in the cars that are stuck along side with you. I can confirm, there are some strange ones out there! We eventually arrived back at the pub (The Plough at Allscott….Oh I’ve mentioned that already, OK) and Dave the chef saved the day and our sanity with a very welcome meal, although I am sure some ate theirs with their eyes shut catching up on a few missed forty winks. Oh, and the Superman pants I mentioned in the title? Sworn to secrecy but the owner did protest strongly that they had faded to pink with age! As I said, it’s all part of rallying! A bit of pampering and the lady looks good. 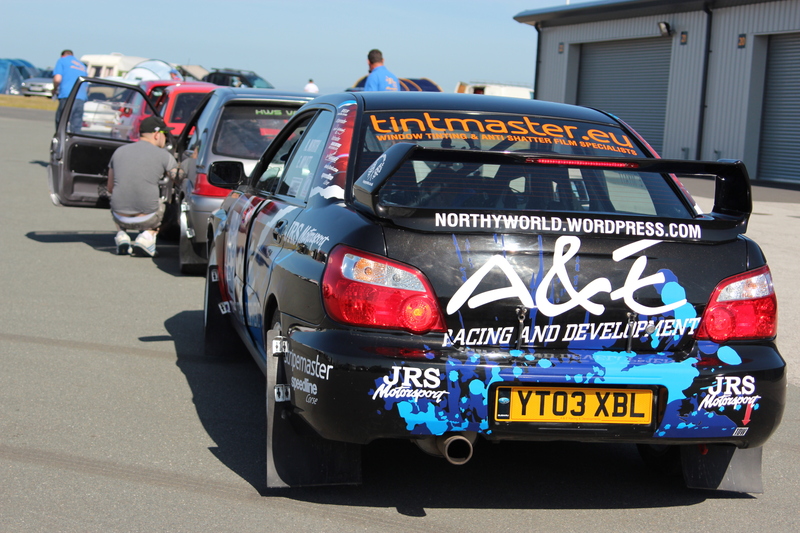 Event three 17.03.13: Anglesey, The Lee Holland Memorial Rally- twelve lads and one girl!